There’s always one. Every time people do something together, someone is the responsibility scallop. Sometimes it’s the boss, sometimes it’s the second-in-command. Usually it’s that busy and worried-looking person who checks on things and reminds other people to follow up on stuff. The responsibility scallop is in charge of the list of what has to be done. 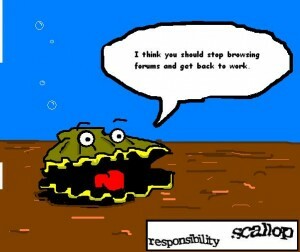 When other people involved aren’t sure how their idea fits into the group effort, they ask the responsibility scallop. And when other people don’t do what they’re totally supposed to do, the responsibility scallop takes care of it for them. No one’s job description is to be the responsibility scallop, and who it is can change, but there always is one. Who they are and what they’re like tells you a lot about any group effort. If you want to be in charge, become the responsibility scallop. You can become the responsibility scallop by being the first person to make a list of the things that your group needs to do to make something happen. If you’re super stressed out, and bearing the whole weight of a project on your shoulders, you’re probably the responsibility scallop. If you want to stop, let someone else make the list. Ask other people what should happen next. They’ll take over scallop duty and you can take a longer lunch. This image, and the term itself, though not its meaning, came from a thread on somethingawful.com a while back. People made images out of the weird combinations of words they got from re-captchas. It was cute.